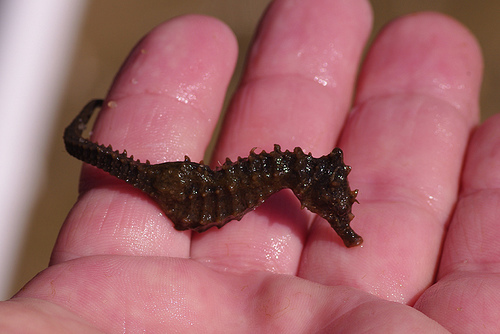 By Terence Zahner When researching warm locations for an early spring diving trip earlier this year, my wife and I had several requirements – excellent diving, the ability to dive right from the shore, minimal travel time, and relatively low cost. The last two criteria placed us firmly in the Caribbean since we live in the Northeast. Upon further research, we discovered Curaçao. Where? When we tell people we were diving in Curaçao, this is the inevitable question. Among non-divers, Curaçao mainly conjures up faint memories of a bottle of mysterious blue liquor. While the island’s name is subject to numerous pronunciation variants, “CUE – ra – sow” is close to correct. This little treasure is located a mere forty miles off the coast of Venezuela and is the largest of the so-called “ABC Islands”, along with Aruba and Bonaire, all of which are part of the Netherlands Antilles. Willemstad, the capital city, is a popular port of call for cruise ships, but aside from that, most of the visitors seem to be divers and there is a definite European flavor to the island. Curaçao is located outside the hurricane belt and SCUBA gear left outside dries quickly in its dry, hot climate. Since the purpose of our trip was diving, we chose to stay at a diving resort, Habitat Curaçao, in order to maximize our time underwater. A diving resort, for those who have not had the pleasure, is situated on the shore, with a “house reef” a short swim offshore and allows unlimited diving 24 hours a day. Air tanks are always available and there is space right near the dock for gearing up. To dive, you just take a short walk down to the end of the dock and jump in. The house reef at Habitat is a wall that runs parallel to the shore. The wall allows for a variety of different dive profiles to suit one’s desires. A large rope connected to the dock extends through the shallows and down to ninety feet on the wall, making navigation a snap. As a photographer, this is an ideal situation, because I can revisit a spot if a shot doesn’t come out the way I wanted. It also allows the freedom to dive frequently at night. Many locations only schedule guided boat dives at night once or twice per week. Diving from shore offers the possibility of diving at night every night, even multiple times per night. I can spend as much time as I want (within safe SCUBA limits) photographing and interacting with a critter, without worrying about other divers’ air consumption or having to leave and get back to a dive boat. All of my dives are an opportunity to practice photography skills. Photography enables me to record and remember what I’ve seen and also share with those who don’t have a chance to venture beneath the waves. On this trip I used a compact point and shoot camera from Canon along with a powerful external strobe and macro lens, both from Inon. It is a portable system that is very easy to use with a little practice. I particularly enjoy shooting macro subjects and this set up is well suited for the task. 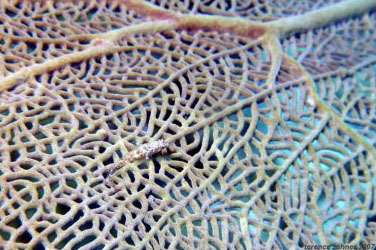 The dive sites around Curaçao offer a diverse mix of soft corals, hard corals, and sponges. The abundance of fish and small critters surpasses what we have seen in other locations in the Caribbean and the reef is in pristine condition due to lower diver traffic. I noticed particular abundance of one of my favorite macro subjects: Giant Anemones and their many symbionts, including Pederson Cleaner Shrimp, Spotted Cleaner Shrimp, Diamond Blennies and Banded Clinging Crabs hiding underneath, which many people miss. Reached mainly by boat, Mushroom Forest is a must see site. 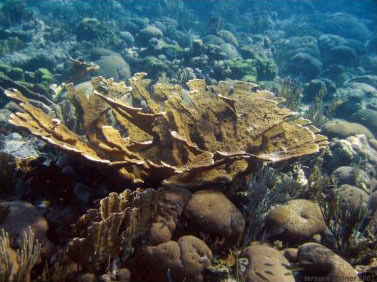 As the name suggests, this site is an extensive area that is covered with large coral formations that look like mushrooms. It is best visited with a local guide, as navigation can be tricky. Another favorite site is called Seldom due to its limited access governed by sea conditions. It is a drift dive along a wall, punctuated by dramatic sponge formations rising from the deep. Along the top of the wall in the shallows, we swam amongst numerous healthy colonies of Elkhorn coral. 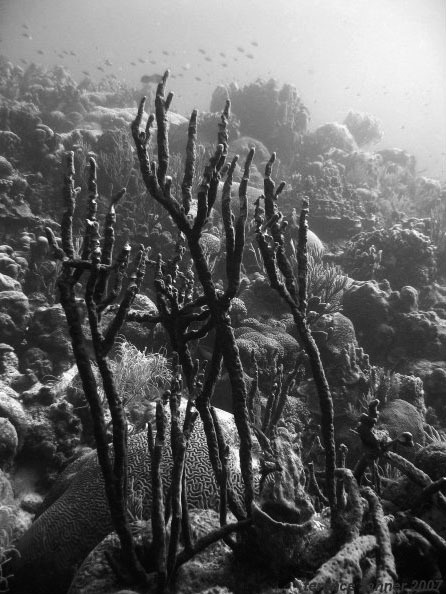 This was an amazing sight, as Elkhorn coral is in severe decline in Florida and many other Caribbean locations as a result of disease, storm activity and human factors. Some researchers estimate a ninety percent loss has occurred over the past two decades. The reef is a very different place at night and offers some interesting opportunities to see and photograph behaviors unseen by many divers. There is a complete changeover of underwater life on the reef at night. Coral polyps are open for feeding and a new cast of nocturnal fish is active while the others sleep. Small worms and other tiny critters are attracted in droves to the light of our dive torches. When the beam of light is near to a coral head, a feeding frenzy occurs, as the corals sting their prey and retract with dinner in their tentacles. It is truly a spectacular display. The extended polyps of Orange Cup Coral are a stunning sight at night, a vivid sunburst of yellow and orange that stands out from the other somewhat earthly tones. Its particular flamboyance makes sense when you consider that it is actually an introduced species native to the Indo-Pacific. 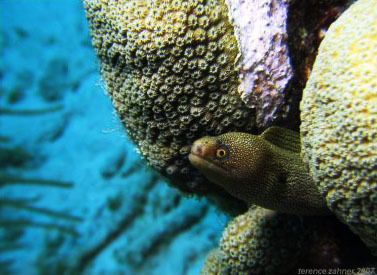 Eels can be observed swimming free in the open at night. Along with numerous Sharptail eels, we encountered a full-grown green moray swimming along the reef in the darkness, a sight that can provoke a primal fear of sea serpents. Squid and octopus sightings are common at night as well. 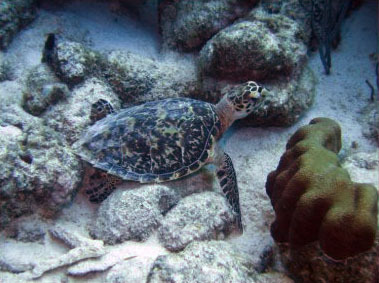 If you’ve never gone SCUBA diving before, Curaçao is a great place to learn. If you’re already a diver, Curaçao is the gem of the Caribbean. Let’s go diving!!!! !